Nanzen-Ji，also　called Zuiryusan，is one of the most　well−known　Rinzai Zen temples in　Japan. Emperor Kameyama loved this beautiful place so much that in 1264 he built his detached palace here. 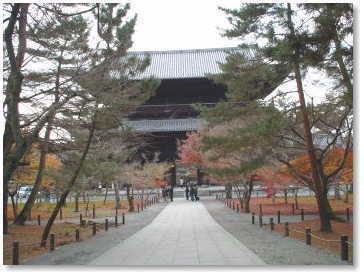 Later he became a student of the Zen Master Busshin Daimin Kokushi，and he dedicated the palace as a Zen temple in 1291. A characteristic of the history of this temple is that its abbot was always chosen as the best Rinzai Zen Master in each period. As Nanzenji was above the Go-San SyStem，its influence on Japanese culture Was indeed great.